A much better showing by Bardez in the second half but there was no way past the sturdy Salgaocar defense today. Their first major defeat and its back to the drawing board for Armando Colaco's men. It doesn't get any easier for the newcomers the as they meet Churchill Brothers next. That game is on Sunday in four days. Stay tuned to khelNow.com as we will be bringing you match report and post match comments from both side of coaches . As always we'll be here to bring you all the action until then its me Ashish Negi signing off. 90' Chatur with a good effort on goal which gets deflected off the keeper for a corner. 89' FC Bardez get a free-kick in which Jessle cross the ball in but it doesn't reach anyone. 88' Salgaocar defence standing firm as Bardez push for a goal. 84' Richard Costa crosses the ball to Chatur who couldn't reach it. 81' GOALL!! Salgaocar Score their 2nd goal.A cross by Rosario In which Liston hit a volley inside the goal. 80' Alesh Sawant takes the corner in turn the defender clears it. 79' Another wave of attack from FC Bardez which give them one more corner . 77' FC Bardez gets a corner. Alesh with a superb cross to Lenstan who finishes the ball into the net .But its offside . 75' FC Bardez Substitution as Cavin Soares comes on for Sarineo. 74' Richard Costa with a lovely cross to Myron who couldn't direct it in the goal. 73' Girish with a long ball to Chatur inside the box who in turn finds the keeper. 72' Bardez need to look to their bench now. 69'FC Bardez Gets a corner. Alesh Sawant takes the corner-kick , Rowilson Rodrigues reaches for it but directs it at the keeper. 67' Gilbert tries a curling shot on goal which goes past the goalpost. 66' Salgaocar get a corner-kick which is taken by Brian who crosses it in but Rowilson clears it. 63' FC Bardez players with a lot of missed passes. They need to keep the ball better. 61' Brian crosses the ball inside the FC Badrez box, Mirshad K clears it. 60' Alesh Sawant passes the ball inside the box,Chatur gets the ball and passes it to Richard who shoots it wide. 58' Alesh Sawant shoots the ball from inside the box, Salgaocar keeper Stops it. 51' FC Bardez trying to get in the Salgaocar box But are failing everytime. 47' Brian crosses the ball inside the box the keeper Mirshad K collects the ball and passes it forward. Good Support for FC Bardez even after heavy rain in Goa. Check out your football knowledge during half time break by playing Khel Now Trivia. The game has been quite even but few clear chances for either side. Salgaocar in the lead after a well taken corner but Colaco will be disappointed with his team's defending for the goal. He faces his first major test with Bardez. Colaco must rally the troops ad inspire a better performance on the second half. 45' 3 minutes of added time. 44' Ronaldo tries a long shot on the FC Badrez goal but Mirshad K stops it. 43' FC Bardez is giving away the ball too often. 40' Chatur Naik takes the free kick and misses the Goal by a whisker. 38' Anil Chawan gets a Yellow Card for a Rash tackle on the Salgaocar Man. 35' FC Bardez midfield is having problems with keeping the ball. 32' Jessel Carneiro crosses the ball in the box from the left flank, Myron gets the ball but can't finish it. 30' GOALLL! Salgaocar FC Scored. Gilbert with a lovely cross, None of the FC Badrez defenders could reach for it as Balwinder Singh reached and headed it in the goal. 26' FC Bardez Coach Telling his boys to "Push Up "
25' Brian with the freekick which is not even close. 24' Richard Costa gets a Yellow card for a rash tackle on Brian.Giving away a freekick 20 yards from the goal. 20' Sereino Fernandes is injured because of a rash tackle by Mackroy. 18' Salgaocar get a cornerkick. FC Bardez Goa Goalkeeper Mirshad K stops it and pushes it forward. 15' Both the teams have equal amount of ball possession . 14' Its raining cats and dogs in Goa and hence the crowd is sparse. 13' Alesh Sawant tries his First shot on goal which goes wide. 12' FC Bardez with their 1st freekick by Jessel who gives it right into the keeper's hands. 10' Salgaocar is keeping the ball in the midfield . 8' Salgaocar Striker Liston Colaco takes the ball past the Bardez fefence but Rowilson clears it. 7' Serineo Fernandes crosses the ball inside the box but the defender clears it. 4' Brian Mascharenhas takes the freekick which goes wide. 3' Richard Costa with a handball which gave Salgaocar a freekick . 2' Salgaocar with their 1st short on on goal which was blocked by Rowilson Rodrigues. 1' Salgaocar FC to start from left to right and We have kick off. 3:59 pm Both teams are entering the filed as kick off is just a minute away. 3:42 pm We are just 18 minutes away from Kick Off . 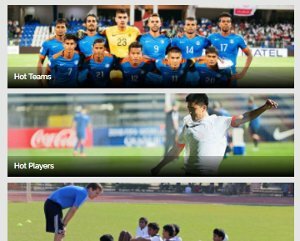 If you guys feeling bore then you guys can check out your football knowledge by playing Khel Now Trivia. 3:19 pm The platters are warming up. They seem excited about the first game of the new League season. 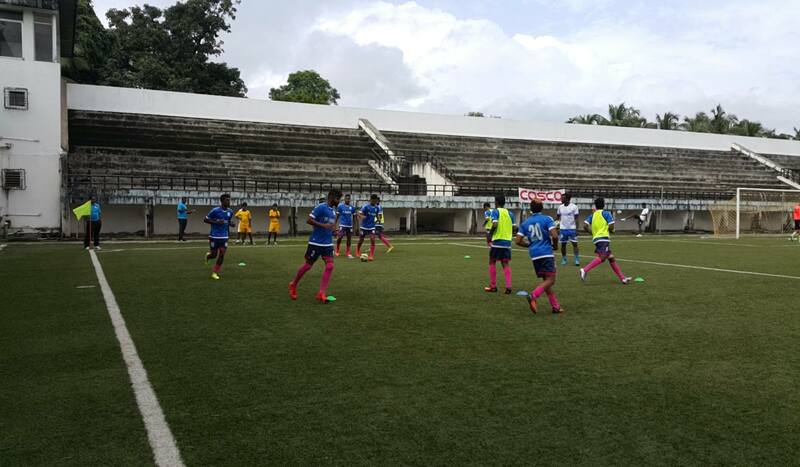 FC Bardez Goa players started their warm up. 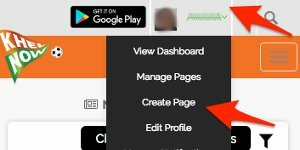 3:10 pm As we are near to kick off , you guys can download our Android app and read live commentary in news section of it . 3:04 pm Both teams have arrived at Duler Stadium. The action is only a 56 minutes away. Stat tuned. 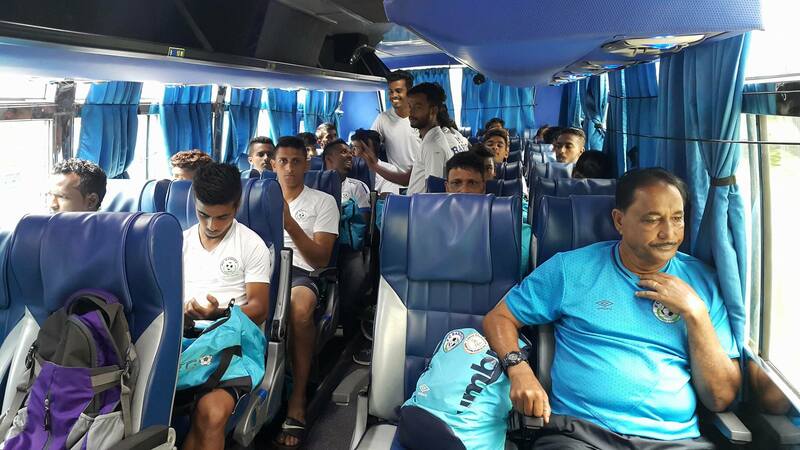 FC Bardez Goa players in team bus . 1:38 pm Yesterday we saw fantastic 35-yard Free Kick by Cajetan Fernandes in Duler stadium . We are hoping for more goals like this for today's match also. 1:35 pm The two sides come into the game in buoyant mood. 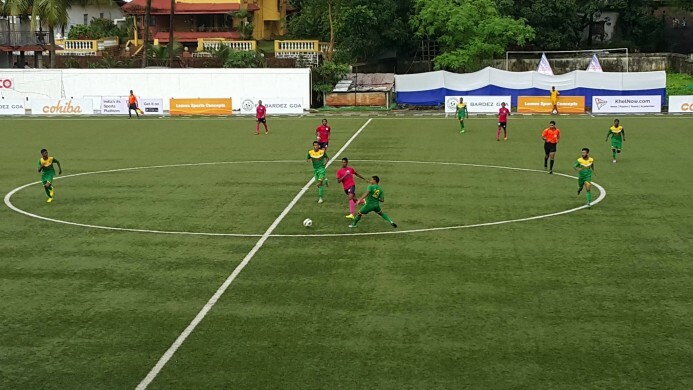 The Greens won the season curtain-raiser against Sporting Clube de Goa. Meanwhile Armando Colaco’s men lifted their maiden silverware in their first official tournament with their resounding success in the Goa Police Cup. 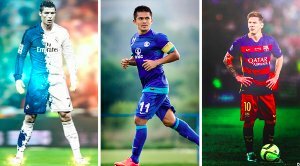 Kick off time is 4 pm IST . 1:12 pm Hello, this is Ashish Negi welcoming you all to the live commmentary of the Goa Pro League contest between FC Bardez Goa and Salgaocar FC. The game is only few hours away. Join us for all the pre-match-build-up right here.